The way I look at it, if you're going to paint signs all over Birmingham, paint something that is positive and makes people feel good. 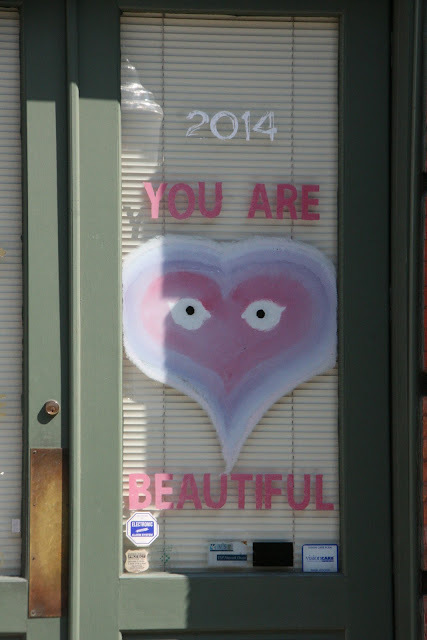 That's the case with the You Are Beautiful signs that have popped up all over our fair city. I'm all for it. I hope to bring you more in the future. AND THE WINNER IS...............Tom Cronier. 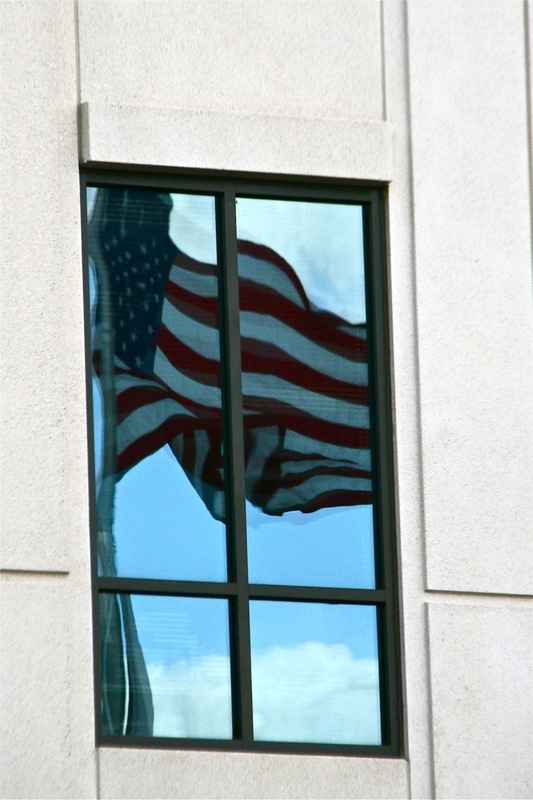 Tom correctly guessed that yesterday's mystery photo was First Presbyterian Church. I took the puzzle shot on the 21st Street side. It's a beautiful church and one with many interesting details. Tom, I'll treat you to a "dog" at Sam's Super Samwiches in Homewood soon my friend! OK Birminghamians, this is a little test for you. I play this on my Paris blog from time to time. Tell me what this is and where it is. A fabulous prize MIGHT be offered to the winner! The Cathedral Church of the Advent downtown on 20th Street, is always catching my eye. Monday - Friday, during Lent, you'll want to head down there at noon for the Lenten service and delicious hot lunch for just $7! Check out the menus here. The Birmingham Botanical Gardens is lovely in any season. There is something blooming most of the year, but I think the arbor in the Rose Garden is beautiful with just the sleeping vines and the patina on the trellis and columns in winter. I joined my friends Bill and Sandi ( Whistlestop Cooking) last night at The Club. I ALWAYS take my camera when I meet them there for a sip. Last night, after weeks of balmy spring weather, it was chilly and the wind was howling atop Red Mountain. I tried to resist, but as we sat overlooking the city, the sunset got prettier and prettier. I grabbed my camera and went out not once, but twice to try and do it justice. I didn't. It seems that many flowers here in Birmingham have declared, " Spring Is Here!" This is really unusual for the end of February, even in the Deep South. I don't think I've worn my heavy coat but twice this winter. 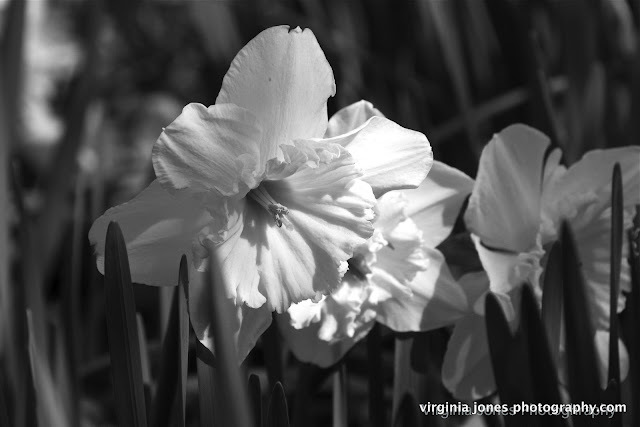 We'll, we will just enjoy the dafs and worry about "that hard freeze/snow we always get in March".... in March! The Alabama Environmental Council has joined forces with the Jefferson County Health Department and will now be offering glass pickups for 35 Birmingham area bars and restaurants. Previously, all these glass bottles went to a landfill, or hopefully to the downtown recycling center that AEC has operated for years in lieu of no Birmingham glass pickup. I think this is a positive sign for our city. Hoping that in months to come, we can all have glass recycling pickup as well! Christopher Glenn Antiques, Garden and Giving in Homewood is a favorite spot to take a few photographs. 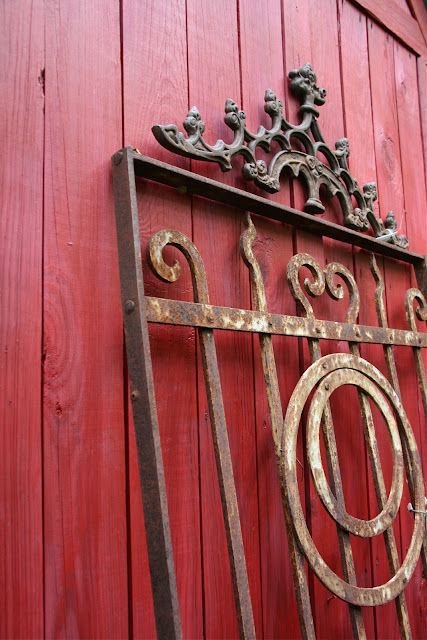 Out in the back, where you can find lovely urns, fountains, and statuary, you'll also find this lovely red wall and vintage iron gate. Waiting for friends for lunch, I decided to snap the moose head that hangs over the bar at Billy's Bar and Grill in English Village has been in business since 1979 and can still draw a crowd. They are known for their grilled chicken sandwich but there's plenty on the menu to choose from. Last Sunday, I was taking a spin around downtown with Josh Hailey and company chasing the last hours of daylight. 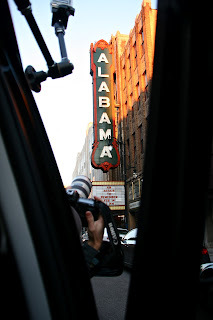 We roared up to the Alabama Theater and I jumped out for a quick snap. Josh caught it from the car... a drive by shooting. Some folks also run/ walk/job for the perks ( no pun intended). Birmingham's Royal Cup Coffee furnishes coffee/donut stops all along the way. 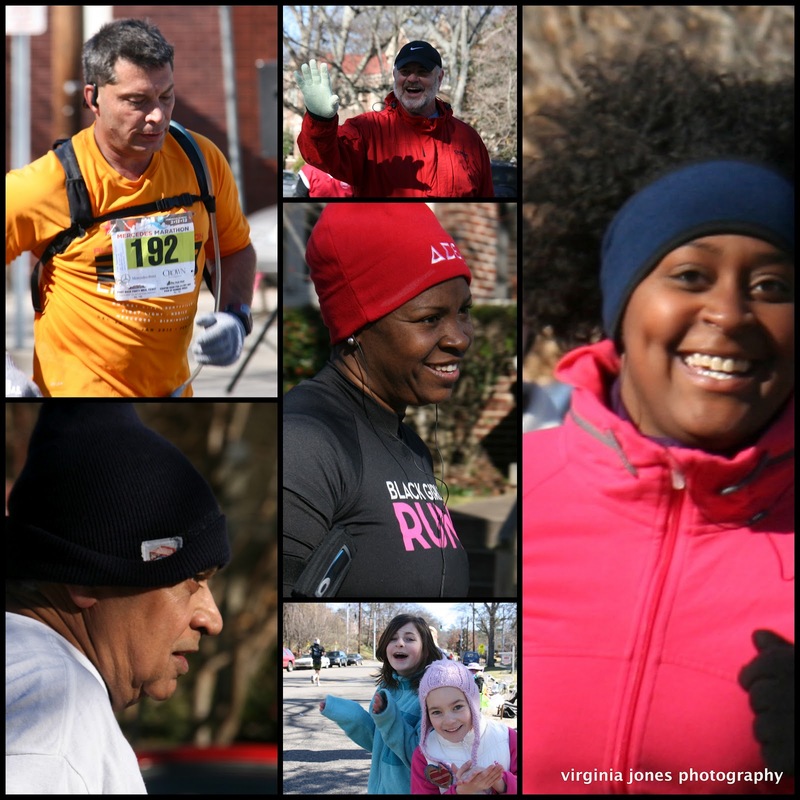 They are a blessing to the runners and the cold bystanders! Today my last photos of the race. Arlington Antebellum Home and Gardens was built in 1850 by one of Birmingham's founding fathers, William S. Mudd. A fine example of Greek Revival architecture, it has been preserved and is the site of many events here in Birmingham. I took this shot after the gates were closed last Sunday evening while riding the streets of Birmingham with Josh Hailey and his friends Jamie and Clay. Josh is visiting all 50 states in 50 weeks for his Photoamerica Project. More on this later, but have a look at his site. 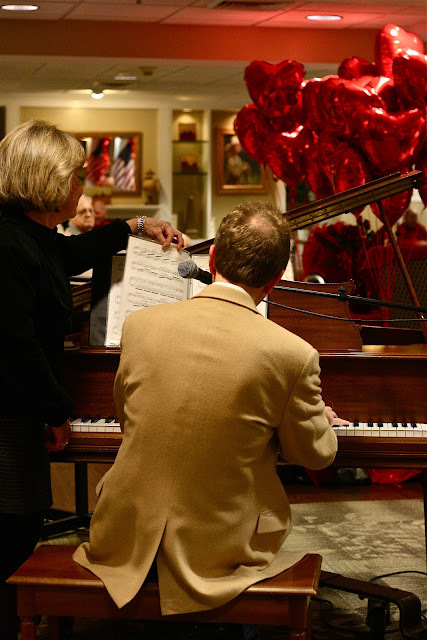 Yesterday my dear friend and very talented pianist, Michael Dulin played a Valentine's concert for the residents at St. Martins in the Pines Assisted Living. There were red balloons, cupcakes, punch and a lot of smiling faces as Michael played some of his original pieces and then took requests from the audience, a crowd pleasure, that brought on so clapping and toe tapping! Tomorrow, come back to meet the King and Queen of Hearts and a few more happy faces. 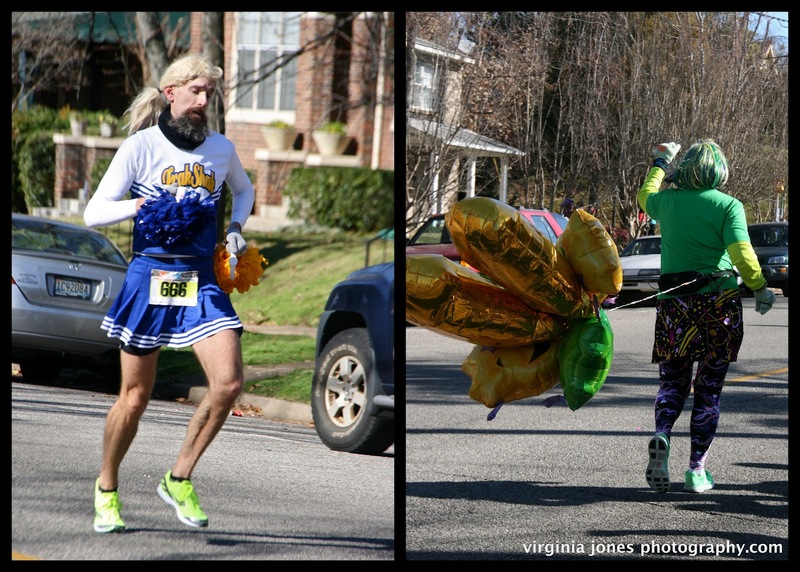 The Mercedes Marathon is a Boston Marathon qualifier so you get a lot of serious runners like these guys. While others take a more light hearted approach! This is an event that Birmingham supports wholeheartedly because it benefits some fine charities. It's well run and well attended. What always impresses me is that it's a mix of very dedicated runners but so many , many dedicated walkers and joggers of all shapes and sizes and abilities. I have many photos to share. Today some faces that I thought represented the event. 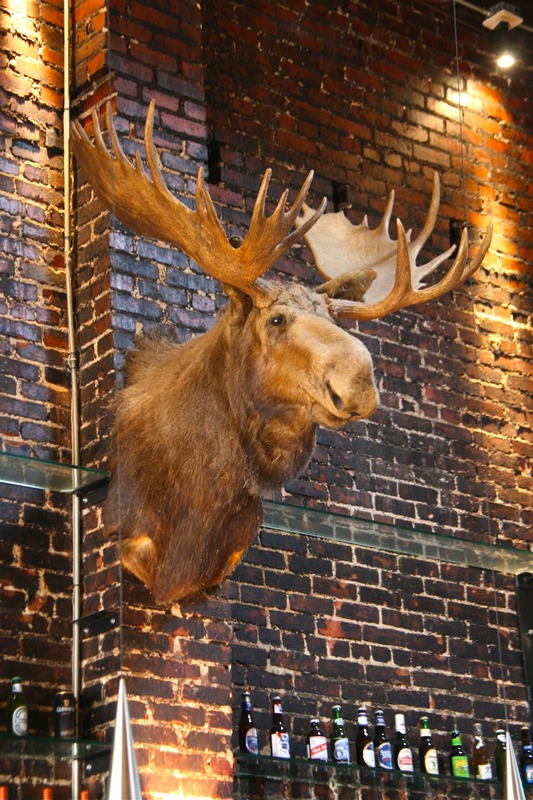 Please click HERE and read the wonderful story of its origin. Today another photograph from Old Live Oak Cemetery in *Selma. I have quite a few more, and I might just share them from time to time. * See yesterday's post for all the details of my visit down to Selma, Alabama. 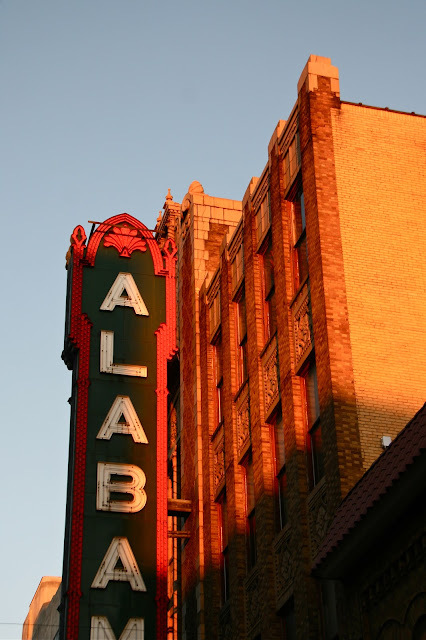 BADP On the Road - Selma, Alabama Of Course! I had some pretty smart folks that guessed Selma Alabama yesterday. Yes, I traveled south of Birmingham to Selma for a blog meeting with Belgian blogger *Anni ( This Is Belgium) and we were greeted by Selma Daily Photo blogger Janet ( Rambling Round) and her cute daughter in law Jenna ( who took this photo). 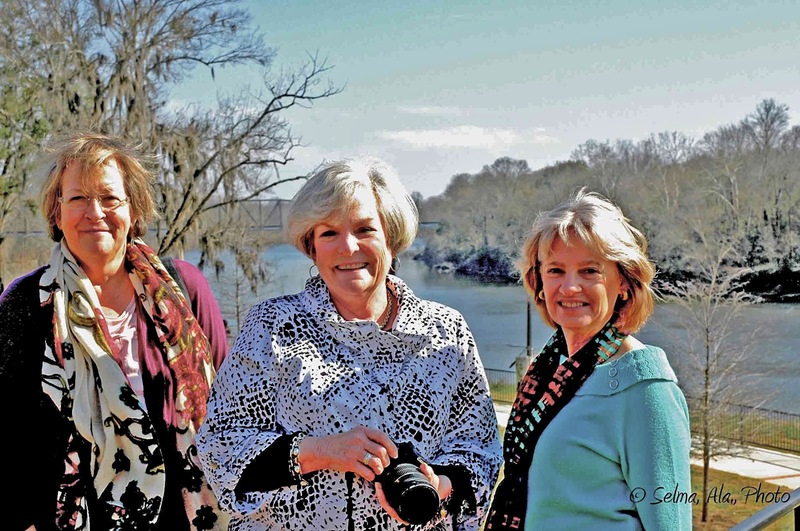 After a lunch full of blog speak we took photos outside by the Alabama River with the Edmund Pettus Bridge, which you saw on yesterday's post. Read about this historical bridge here. 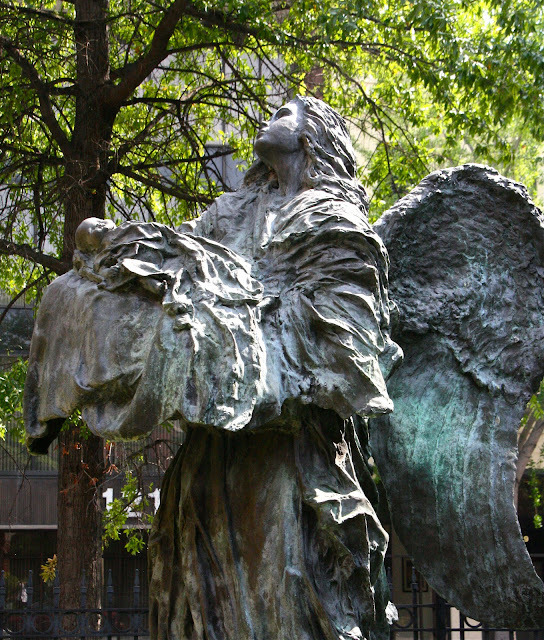 Today I share a photo of the happy bloggers and a look at one of the most beautiful cemeteries I've photographed. For those of you not from these parts, that's Spanish moss hanging from the trees. I could hardly contain my excitement when we drove up and I saw the afternoon light shining through the trees and moss. 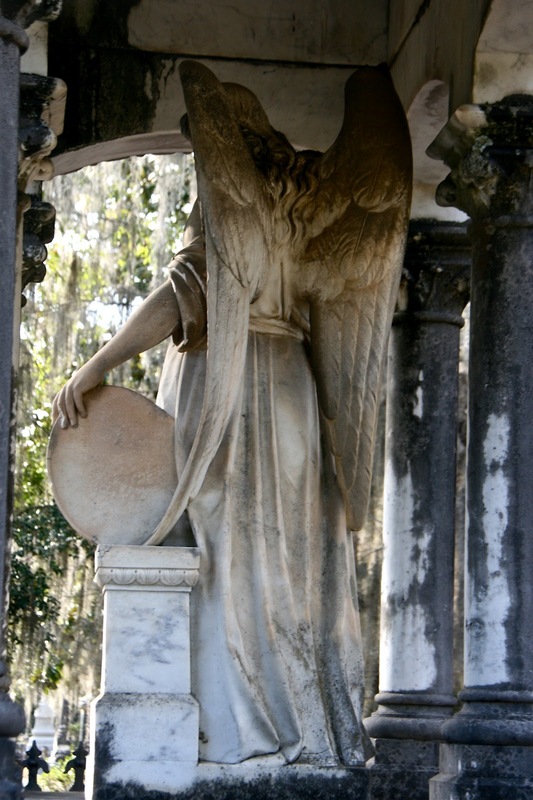 Oh don't you worry, I'll share a few more photos from Old Live Oak Cemetery in a the days to come. * If you're wondering what Anni to Alabama, well her husband was born in Auburn and grew up in Thomasville, AL, and graduated from Auburn. He moved to Belgium after law school and the rest is history. He and Anni visit his family here every two years. I'm so glad Anni and I met through my Paris blog and were able to find a spot halfway from Thomasville and B'ham. Selma was just perfect and I was able to meet Janet for the first time as well! Yesterday I left B'ham to meet two bloggers. I offer this photo as a clue. Want to guess my destination?? Come back tomorrow for the answer and more! A friend sat nearby at church last Sunday with a beautiful pale pink camellia pinned to her jacket. We're so lucky to have this breath of spring blooming in the winter months here in Birmingham! This one is from the Birmingham Botanical Gardens where there is an entire area of gorgeous bushes and even more growing inside the Conservatory. Recently I was fortunate to photograph the STAIR reading program at Norwood Elementary School in north Birmingham. 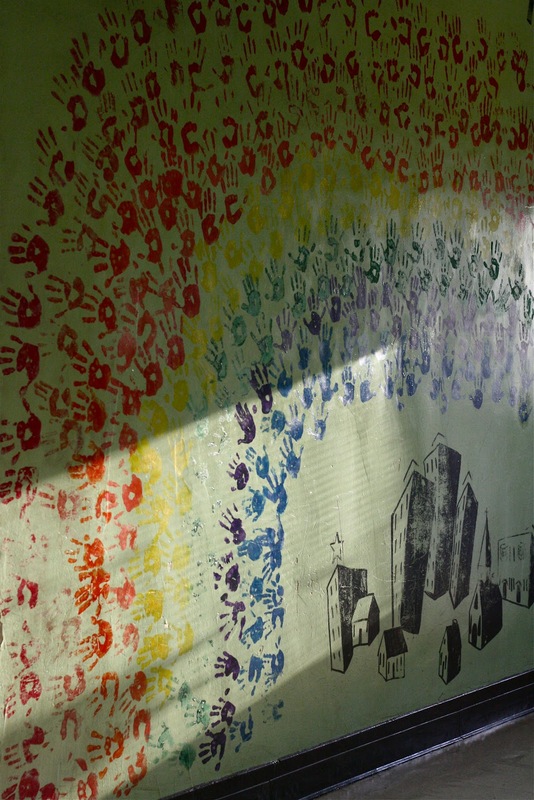 This delightful mural greets visitors and students as they enter the front doors of the school. The title is , "It Takes A Village". When it comes to scarves and pashminas, one can never have too many. Yesterday I was downtown at Sojourns Fair Trade and took a few minutes to drool over these yummy pashminas made with cashmere and the proceeds benefit an orphange in Nepal. I think Sojourns is just about the most fun shop in town, and for such a good cause. The key goals of fair trade are to empower low-income, disadvantaged artisans, laborers and farmers around the globe, and to promote understanding between them and industrialized nations. Spring Has Sprung.......but much too soon! This is not unusual. Many times in mid-winter, Birmingham has unseasonably warm weather and all the blooming plants just........BLOOM! Here it is the first of February, and daffodils are peeking out , the tulip trees and quince are blooming away........so we just enjoy... and wait for the sure to come freeze. Yesterday this beautiful tulip tree was in full bloom downtown on 20th Street. We can expect a hard freeze at some point, but for now......we're enjoying shirt sleeve weather! And how about that flower shop...what a great name ! Savage's Bakery, founded in 1939 by William Savage, has been a Homewood tradition since the 1950's. Owner Van Scott has kept the tradition going, and I can assure you that the famous "SMILEY FACE COOKIES" are a hit will all the kiddos. Their other baked goods are a hit with the grownups as well! See for yourself. Late Breaking News. When I did this post earlier this week, I had no idea that the Homewood Star newspaper would be featuring my story in their February issue online for me to share. Thank you to Editor Ashley Berkery for the terrific article that you can read for yourself right HERE. The playground equipment at Birmingham's new Railroad Park is irresistible for kids and photographers alike. Alabama Gives Day - What If Every Child Could Read? Today, February 2, marks a statewide initiative to raise much needed donations for Alabama's nonprofit agencies. Although each and everyone is deserving, I chose a program near and dear to my heart. STAIR Birmingham's first site was at my church Independent Presbyterian. Now thanks to willing volunteers there are sites in Ensley, Woodlawn, Norwood and Avondale. Their website says it all. STAIR, an acronym for Start the Adventure in Reading, works with second grade children who are reading below grade level in an effort to give those children, who have not been successful in learning to read in first grade, a chance to catch up with their peers. Research shows the optimum time to master reading skills is by the end of second grade. Each child attends STAIR two days a week and meets with a trained volunteer. The structured lessons engage the student by using phonics, sight words, alphabet review, and games. During the course of the school year, the students develop reading comprehension, vocabulary, and writing skills. 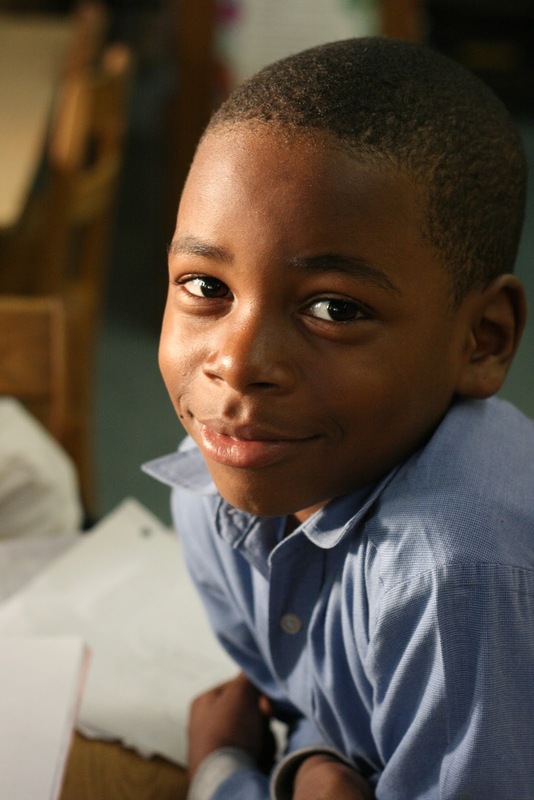 To date, students who complete the STAIR program improve their reading test scores by an average of 96%. I have had the privilege of being their photographer for several years and put together a short movie that you can see HERE and also make a much needed and appreciated donation. If you get down on "dog level" you will usually get a big SLURP on your lens! My entry in the City Daily Photo Blog Theme Day....ANIMALS! Today my City Daily Photo blog friends around the world are posting their favorite ANIMAL shot. Click HERE to see them all!